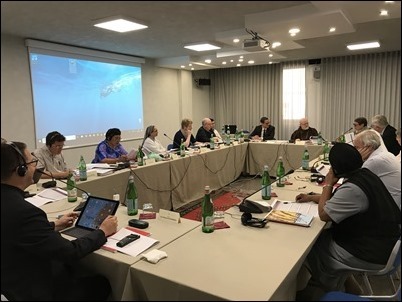 This week, I write to you from Rome, where I have been attending meetings of the Pontifical Commission for the Protection of Minors and the C9 Council of Cardinals. Judge Neville Owen, from Australia, who is a former senior judge of the Court of Appeal of Western Australia. He chaired the Truth, Justice and Healing Council created by the Catholic Church in Australia in response to the findings of the Royal Commission into Institutional Responses to Child Sexual Abuse. Prof. Myriam Wijlens, from the Netherlands, who is a professor of Canon Law and has done a great deal of work in the area of child protection. Teresa Kettelkamp, from the United States, who has been working with the Commission for some time and now has been named a full member of the Commission. She is a former colonel in the Illinois State Police and headed the U.S. Conference of Catholic Bishops’ Secretariat of Child and Youth Protection. Nelson Dos Santos, from Brazil, who is an expert in the rehabilitation of youth from drug addiction and abuse. Prof. Benyam Mezmur, of Ethiopia, is a Coptic Orthodox attorney who has been the head of the U.N. Committee on the Rights of the Child. He is a very accomplished man with great experience. We are very fortunate to have him on the Commission. Sister Jane Bertelsen, a Franciscan Sister from England, who has served with the Franciscan Missionaries of Divine Motherhood. She has worked for years in the development of Church child protection policies in England and Wales, as well as Australia, and served as the vice-chair of the National Catholic Safeguarding Commission in England/Wales from 2007 to 2013. She is also on the council of superiors of her community. Prof. Ernesto Caffo, from Italy, who is a professor of Child and Adolescent Psychiatry at the University of Modena. He has also been very involved in the area of exploited children. Sinalelea Fe’ao, from Tonga, who is the coordinator of the Religious Education Curriculum and Counselling Services for Catholic schools in the Diocese of Tonga and Niue. Sister Arina Gonsalves, from India, is the Vice Provincial of the Religious of Jesus and Mary. She has a background in psychology, law and education. Having new members from so many different parts of the world has been a great blessing for us. Our meetings began last Wednesday and Thursday with a long session with a group of victims and survivors from England and Wales. 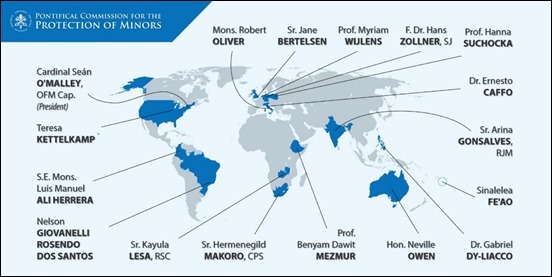 These were members of the Survivor Advisory Panel, a group that is organized to provide input to the bishops’ conference there and their National Catholic Safeguarding Commission. Then, on Saturday and Sunday, we held our plenary session. During our meetings, we discussed a number of topics, and some of our new members gave us reports on their work. Judge Owen spoke to us about the report of the Royal Commission in Australia and Prof. Nesbitt spoke to us about children’s rights and the situation in many different African countries. Then, Nelson Dos Santos spoke to us about the work of his community, Fazenda da Esperança, which helps people suffering from addiction and abuse in various countries. We also established three different working groups: one on guidelines and policies concerning child protection, another on outreach and pastoral care for victims and survivors, and the third on education and information. 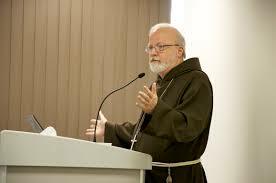 Of course, we continue to be involved in the training of Church leadership, new bishops, bishops’ conferences and conferences of religious superiors, seminary rectors and other groups throughout the world. I encourage you all to visit the website of the Commission www.protectionofminors.va to learn more about the many different aspects of our work. 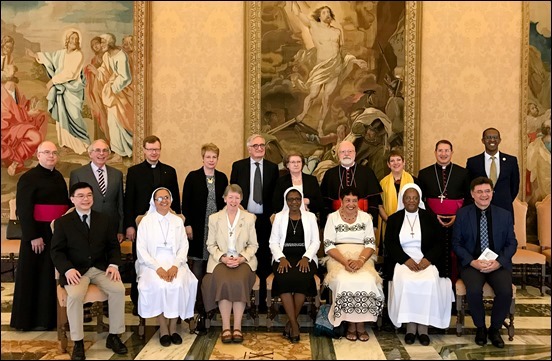 One of the highlights of our gathering was our meeting with the Holy Father on Saturday, at which time two of the members presented the ideas, hopes and expectations of the Commission in its new iteration. 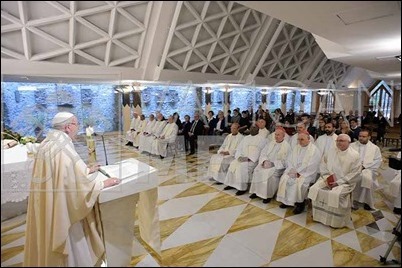 In our meeting, the Holy Father announced that he was going to make our statutes permanent, previously they had been approved “ad experimentum” for three years. On Monday, we began our meetings of the C9 Council of Cardinals, which, as usual, ran until Wednesday. During this session, we devoted much of our attention to the drafting of the new Apostolic Constitution of the Roman Curia which will, of course, be presented to the Holy Father for his review and approval. The new constitution focuses on the Curia’s role of serving the Holy Father and the local churches, emphasizing the pastoral nature of their work, and developing a new section of the Secretariat of State that will focus on the diplomatic service of the Holy See. During our meetings, I was also able to brief the Council on the progress being made at the Pontifical Commission for the Protection of Minors, and particularly about the meeting we had with the Survivor Advisory Panel and about the importance for all of us to listen to the experiences of abuse survivors. About the Archdiocese of Boston: The Diocese of Boston was founded on April 8, 1808 and was elevated to Archdiocese in 1875. Currently serving the needs of 1.8 million Catholics, the Archdiocese of Boston is an ethnically diverse and spiritually enriching faith community consisting of 289 parishes, across 144 communities, educating approximately 38,000 students in its Catholic schools and 156,000 in religious education classes each year, ministering to the needs of 200,000 individuals through its pastoral and social service outreach. Mass is celebrated in nearly twenty different languages each week. For more information, please visit www.BostonCatholic.org.